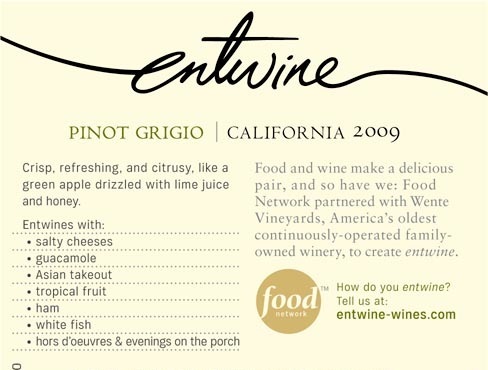 This past summer TV’s Food Network and California’s family-owned Wente Vineyards collaborated to create entwine wines, a portfolio of Pinot Grigio, Chardonnay, Merlot and Cabernet Sauvignon that retail for $12.99. Beginning in late January, Wente Vineyards is offering visitors a special behind-the-scenes tour of its historic Livermore Valley winery, where entwine wines are produced. The tour will include an exclusive tableside food and wine pairing experience. This month’s tours will be held on Thursday, January 19, at 12 p.m. and 4 p.m., and Saturday, January 21, at 2 p.m. Thereafter, tours will be held on the third week of each month, from Monday-Thursday (twice daily at 12 p.m. and 4 p.m.) and Saturday (2 p.m. only). The fee of $25/person includes a tour of the winery and winemaking facilities, specialized entwine and food pairings, and a 20% discount on all entwine and Wente Family Estates wines purchased the week of the tour. A little background: The initial inspiration for entwine came from viewers’ requesting the Food Network to introduce them to the world of wine. Food Network partnered with Wente Vineyards because Wente makes great wine and has a deep connection to food as embodied in its vegetable garden and on-site restaurant. Founded in 1883, Wente Vineyards is the oldest continuously-operated, family-owned winery in the country; owned and managed by the fourth and fifth generations of the Wente family. In 2011, Wente Family Estates was named American Winery of the Year by Wine Enthusiast and a top 30 wine company by Wine Business Monthly. The Food Network is a lifestyle network, website and magazine connecting viewers to the power and joy of food. Food Network is distributed to more than 100 million U.S. households and averages more than 9.9 million unique web users monthly.